It’s January, and this is the time of year when people decide to make sacrifices – they resolve to lose weight, stop smoking, stop drinking or whatever. I don’t make resolutions, but I do make goals for my business, my home and my personal self. There’s a subtle pressure, though, to make sacrifices. In our Sunday morning small group, we started a study of fasting as Daniel fasted (restricted himself to a vegetarian diet) with the understanding that each member would undertake a fast of some sort. My husband and I talked and batted ideas around. We thought at first about giving up meat for a week, but we easily go vegetarian some days, anyway, so this wouldn’t be much of a challenge for us. He also suggested coffee, but didn’t want to subject our girls to me without my morning cuppa (besides, I’d just drink green tea, and I only drink one mug of coffee a day). I was intentional about giving up sweet snacks – cookies, chocolate, candy, everything. I started this this past Monday and said I’d go a full seven days which will end tomorrow night. Thursday morning in the shower, I thought, I could do this another week. Thursday at lunchtime, when I cleared the halfway mark, but Thursday afternoon was tough! I’d stashed all the chocolate and candy on the top shelf of the pantry where I couldn’t see them easily, but Thursday afternoon, my mind kept drifting to the container of Trader Joe’s chocolate cat cookies. I’m proud to say I resisted, but it was close! At the same time this was going on, Peter and I started attending a Financial Peace University class. Talk about sacrifices! First, I sacrificed the $50 I was going to spend on a new pair of clogs for our course materials. Today we spent a couple of hours creating our cash flow plan (aka, budget). The goal was to create a zero-based budget, one with no money left over and no overspending. We did it – sort of. It doesn’t allow for any saving this month, though. The course instructors told us – pretty much promised us – that we would fight during the budget making process. I’m glad to say we didn’t. Shoot! I was psychologically ready for it, because we seem to fight about money most of the time, anyway. Seriously, when Dave Ramsey says that couples fight over money more than anything, absolutely believe him. Men, when he says your wife’s feelings of security are tied to money, believe him – and when finances are tight, give her lots of hugs and spoon her as you sleep. Women, when your husband is feeling like he’s less of a man because he’s not making enough to keep your security anxieties from flaring up, tell him all the ways he’s doing great and insist you create a budget together – and STICK TO IT! Anyway, I figured fighting with Peter in the course of making a budget (something we so rarely do) wouldn’t be that bad. After all, we might be fighting, but fighting is still a form of communication, and we’d be fighting in the midst of doing something positive. See what I’m saying? To me, it’s better to fight as we’re doing something to change our current situation. I’m proud to say, we did not fight. We did not raise our voices. We prayed together before we started, we gave it over to God and we listened to each other. I see where we are as we go into February, but I also see where we are going to be. The first cut is Peter’s AFLAC policy. Why pay that money to AFLAC when we can put it into our emergency fund and draw interest on it? The second cut will be cable (after the Super Bowl). 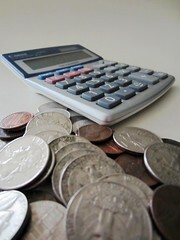 Some expenses that have to be lump payments now will be 1/12 payments hereafter. Sure, we’re sacrificing some things, but I get excited thinking about where these sacrifices will take us. I’m excited, too, that Peter and I are finally on the same page with this! Since we’re a family, we are approaching this as a family. One of our line items is to pay our older daughter commission for doing chores. She will get $1.00 per chore per week, paid in $1.00 bills. She’ll have three envelopes – “Save,” “Spend” and “Give.” One dollar will go into “give” and she can divide the other four dollars however she likes. She’s ready to do chores and she’s totally excited about depositing her money into her accounts and earning “Rainbow Bucks” from the bank that she’ll be able to redeem for gift cards. Talk about motivation! She’ll be able to watch her money grow through the month, then watch her savings grow. Follow along as I tell you about our saving journey. I’m trying not to read ahead, but apparently we’ll learn how we can also pay our mortgage off quicker, so I’m greatly anticipating being 100% debt-free. This entry was posted in Faith, Parenting, WAHMness and tagged AFLAC, Dave Ramsey, Financial Peace University, God, Money, Sacrifice, Super Bowl, Vegetarianism. Bookmark the permalink.